April 24, the day on which the Armenian diaspora memorializes the 1915 massacre of its ancestors, will provide a critical litmus test for just how Obama will approach the Armenian question. Traditionally, U.S. presidents have commemorated the day with speeches and a short letter to the Armenian-American community, artfully finding ways to express solidarity with the Armenian community while eschewing recognition of the massacres as "genocide." With the Armenian vote in mind, Barack Obama promised in January 2008 to not dance around the word "genocide." The Armenian National Committee of America's endorsement at his back, President Obama now has less than three months left to decide whether this campaign promise will be among the first broken. (President Bush broke his promise in 2000, so such a move would not be without precedent.) In pledging to "recognize the Armenian genocide," Obama stands alongside Secretary of State Hillary Clinton and Vice President Joe Biden, and Speaker of the House Nancy Pelosi, all of whom have made similar commitments to ANCA and the Armenian community. The Armenian diaspora in America has long lobbied the U.S. Congress to pass legislation enshrining the genocide label in U.S. law. And, they have come close to succeeding. In October 2007, H.R. 106 won approval in the House Foreign Affairs Committee only to be defeated at the behest of President Bush and defense-oriented politicians worried the legislation might undermine the war in Iraq. Co-sponsors of the bill like Rep. John Murtha reversed their position in the face of extreme diplomatic and lobbying pressure from Turkey, which removed its ambassador and spent huge sums on lobbying fees. A similar resolution met the same demise in October 2000 when it was squashed by President Clinton under the same pressures. The systematic 1915 massacre of Armenians by Ottoman forces resulted in an Armenian diaspora that has since long worked to have the historical events that resulted in their displacement recognized as genocide by the international community. Since its founding, Turkey has denied the Armenian claims, and the facts of 1915 have been an issue of heated contention since. While progress has been made in terms of studying and understanding just what happened in 1915, history remains largely obfuscated by propaganda produced by both sides. While the Armenian diaspora doggedly continues to lobby governments in the states to which they have relocated, the Turkish state refuses to acknowledge the Ottoman crimes as systematic slaughter, much more "genocide." Ömer Taşpınar writes that Turkish success in resisting Armenian genocide recongition efforts are largely "pyrrhic victories." According to Taşpınar, Turkish victories in the halls of foreign congresses make Turkey look thuggish. When a genocide resolution is introduced, no substantive debate unfolds as to whether the 1915 massacres can actually be considered "genocide." Instead, Turkey expends diplomatic capital -- not to mention huge amounts of money for Washington lobbyists -- to defeat the resolution, its victory the result of its geopolitical importance to the United States rather than the correctness of its argument. Prime Minister Erdoğan has already warned Obama of genocide acknowledgement, and Foreign Minister Ali Bababcan recently argued that such a move from the United States would undermine progress Armenia and Turkey have made in reconciling past conflicts. In the past, Turkey has successfully managed to throw its strategic importance about so as to effectively rebuff America's sizable Armenian diaspora. However, with Obama seeming intent to keep campaign promises and Turkey's political clout in Washington significantly weakened in the wake of Davos, this might just be the year that the Armenia diaspora succeeds in getting that which it has for so long pushed and prodded. Israeli and Jewish-American lobbying groups in the United States have long supported Turkey against past efforts by the Armenian community, but Davos has given America's powerful Israeli lobby reason to withdraw this backing. Despite the increased strength of the Armenian position, the Obama Administration is ultimately in the driver's seat. If Obama stops short of recognizing the 1915 massacres as genocide come April 24 and convinces Congress to keep H.R. 106 off the table, recent rapprochement between Turkey and Armenia might defuse the issue once and for all. Turkey broke off diplomatic conflict with Armenia in 1993, soon after Armenia became independent from the Soviet Union and following its invasion of Nagorno-Karabakh. However, secret talks between both states commenced in July, and in Septemeber, Armenian President Serzh Sarkisian extended an invitation to President Gül to watch the Turkish team play Armenia in Yerevan. Despite plenty of opposition, Gül accepted the invitation and briefly opened its border with Armenia. Since then, the two states have made real efforts to establish good relations. At the same time, considerable movement has occurred inside Turkey to recognize the massacres of 1915 as a genocide, and at the very least, come to some more conciliatory diplomatic settling of the dispute. If Armenia and Turkey could come to some satisfactory resolution about 1915, then future attempts by the Armenian diaspora would be significantly weakened and the potentially derailing impact of the issue on U.S.-Turkey relations eliminated. Evidencing the potential for these steps in positive relations is the recent response of Armenian intellectuals to a petition organized by Turkish intellectuals in December and since signed by thousands of Turkish citizens. Although the Turkish petition did not use the word "genocide," referring instead to the 1915 massacres as "the Great Catastrophe," it was an important and hard-fought first step. Reciprocally, the Armenian petition apologizes for the killing of Turks by Armenians. The Armenian response should bolster support for moves to acknowledge the killings. UPDATE 2/9 -- The Armenian petition referenced above has been aborted. Dr. Armen Gavakian from the Macquarie University in Sydney, inspired by a Turkish initiative, decided last month to launch a campaign to apologize to Turks for murders committed by the Asala organization in the 1980s. 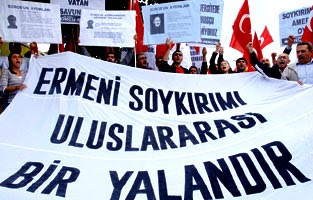 Gakavian, however, retracted the campaign over fierce criticism from Armenian diaspora, Hürriyet wrote. For full article, click here.